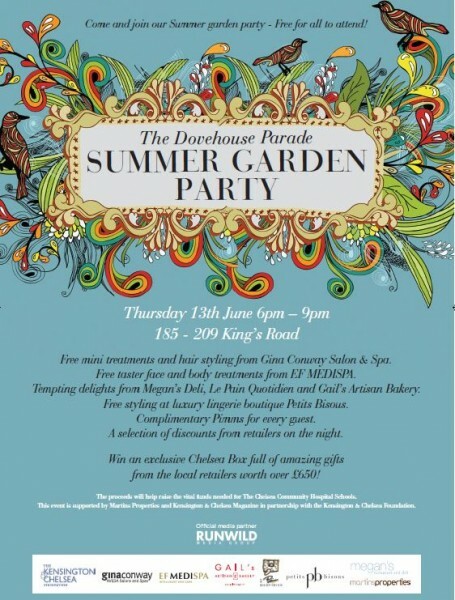 This Thursday June 13, The Dovehouse Parade at 185-209 Kings Road, and the Kensington and Chelsea Foundation have jointed forces to launch their late night-Summer Garden Party to raise money for The Chelsea Community Hospital Schools charity. 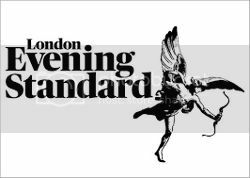 From 6-9PM, the retailers and business in this area are keeping their doors open and treating you to special events, treatments and discounts. There will also be an opportunity to win an exclusive Chelsea Box worth approximately £800 by purchasing one raffle ticket. The winner will receive a haircut and blow-dry by Natalie Love from Gina Conway Aveda salon, a gift voucher for luxury lingerie boutique Petits Bisous, a skin analysis and mini-facial at EF Medispa, a copy of Orla Kiely’s book “Patterns”, a 30-day UNLIMITED membership to barrecore (worth £275), food and wine goodies from Megan’s, and much more! On the night, EF MediSpa will be offering free consultations and free taster face and body treatments. Petits Bisous will be offering styling appointments, with the super-gorgeous barrecore instructors who will be showcasing “barre” moves in the shop windows in two-piece swimwear. The Gina Conway Aveda Salon is offering complimentary hair-ups, hair consults, brow-shaping and manicures. Megan’s will be serving canapés and wine, and there will be special offers at Orla Kiely. The Summer Garden Party is located between 185-209 Kings Road, London SW3 5EB. Follow the pop-up gardens and white, picket fences on the Dovehouse Parade.